Since quasi-uniform spaces were defined in 1948, a diverse and widely dispersed literatureconcerning them has emerged. In Quasi-Uniform Spaces, the authors present a comprehensivestudy of these structures, together with the theory of quasi-proximities. In additionto new results unavailable elsewhere, the volume unites fundamental materialheretofore scattered throughout the literature.Quasi-Uniform Spaces shows by example that these structures provide a natural approachto the study of point-set topology. It is the only source for many results related to completeness,and a primary source for the study of both transitive and quasi-metric spaces.Included are H. Junnila's analogue of Tamano's theorem, J. Kofner's result showing thatevery GO space is transitive, and R. Fox's example of a non-quasi-metrizable r-space. Inaddition to numerous interesting problems mentioned throughout the text , 22 formalresearch problems are featured. The book nurtures a radically different viewpoint oftopology , leading to new insights into purely topological problems.Since every topological space admits a quasi-uniformity, the study of quasi-uniformspaces can be seen as no less general than the study of topological spaces. 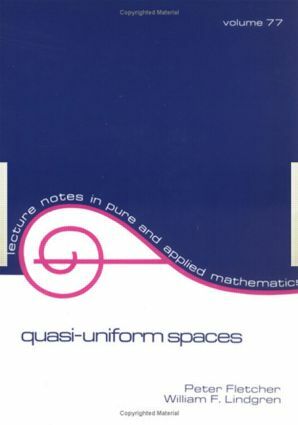 For such study,Quasi-Uniform Spaces is a necessary, self-contained reference for both researchers andgraduate students of general topology . Information is made particularly accessible withthe inclusion of an extensive index and bibliography .